A nice little store (havent bought from them yet) with shipping included in the price. They have Pmag hi-caps, ranger plate, magpuls for both 5,56 and 7,62 and CTR, UBR and M93R stock. Airsoftpark.com is great. I bought the CTR from them and it arrived very very fast, faster than rsov.com. Are these CTR stocks ACM replicas or the PTS version? The description is rather unclear, but I'm guessing they are ACM based on the cost. Dboys or Element, most likely. Sigh... no, we do not need to go through this again... Good Lord. The aforementioned stock is ACM, and I'm not even going to dignify the ACM/PTS debate with a response. Nickthebrick has indicated that the stock has no trademarks of any kind, PTS or otherwise. Airsoft Park is very trusted by many members of the MA community. I'd say they're safe. That aside, I just wanted to mention that I put in my order for one of those CTR stocks from Airsoft Park. Less than five hours after ordering I received an e-mail from their customer service telling me that the item had shipped and should arrive in 10-15 days. Frankly, I am amazed by this. Ordering for EBB you're lucky to get anything at all unless you e-mail them first. If they deign to reply to your e-mail you'll typically get some sort of half-assed no punctuation, no capitalization nonsense bordering on the postmodern. Now, granted the item has yet to arrive, but based on my experience so far I'm fairly impressed with Airsoft Park. I can't believe it took you this long to find things. Your news-fu is weak. Give up and go back into your hole. Too bad the color is not right on that replica 553. I bet the replica ARMS QD mount on it still has fitment issues on picatinny rails. On the black replica 553's, you need to grind/dremel down the inside edges of the attachment latch to fit onto a a rail. Then, everything that is airsoft is a clone. Yes, why would there be a difference between RS parts and AS parts in the first place? what was I thinking? In any case, Airsoftpark is less cheaper. Might try it out if they have something others do not have. Never had a problem with EBB. I always maintain good constructive correspondance with shops, it's amazing how far that gets you. also, just wondering, is the ctr stock (clone or no clone) good quality? wobble much? durable? looks like the old WE dragon to me, been about ages. Yep that's the old WE Dragon. POS. I just ordered the UBR stock. Will post if it is any good once I receive it. god help you if you ever see a genuine MagPul stock. $200+ anyone? Oh, and Plasticmag: go be pathetic somewhere else. if only they did the 93b in some kind of brown rather than just black. M93B isn't exactly the easiest thing to get krylon to stick to. 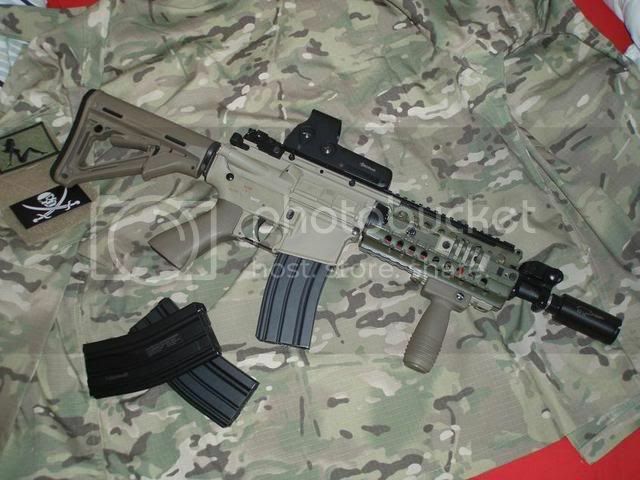 They now have the CTr in tan, so I hope theyll have the M93 in that colour soon. Tan 93b!! please!! My fingers are so crossed that they look like a cheese twist. got my UBR today from another shop. its sturdy, but the overall quality is not as nice as the M93 or CTR. Sorry if this is somewhat off-topic but, does anyone know if any form of LiPo battery can fit in the UBR Replica's proprietary buffer tube? the AEG adapter has place for the wires so it might be possible to lead them out from the back. the cheektubes diameter is 2.8 cm and with the AEG adapter you will have approx 11 cm for battery space. Ordered A CTR and a few other bits from the ebay store listed, Quick postage (under a week) and free Haribo! I mean, what else can one ask for?